When you spend a subtle amount of money of $4,295 on a massage chair, you wish for three things performance, features and durability. This massage chair is a complete package of all those three requirements with some extra pinch of Osaki’s goodwill. The OS-7075R elite massage chair has one of the most comfortable seating and upholstery in its category. The new model update brings along very cool features without any extra cost. The bug fixing frequency of Osaki manufacturers is pretty high. You report a bug and the next segment that is available for sale will be made sure not to have it. Also, even the tiniest of bugs and faults are worked on whenever they comply with the warranty policies. The chair specialises in deep tissue massage and helps sore the back muscles really quick. The massaging modes work intensely even on the lowest settings and are customisable according to the user’s wish. The chair comes with a full body scanner to automatically detect the body shape and accurately massage the massaging points as well as keep the functioning of the massage chair flexible. The chair is good for people with all body sizes. Whether they are tall, or have broad shoulders or are tiny and extremely thing. The chair will customize the massages accordingly and stretch the leg and recliners accordingly. The latest model of OS-7075R comes with updated synthetic leather which is really smooth and comfortable. Even when the massage chair is not working, the upholstery works just fine as a lounge or couch. The built of the chair is heavy and strong enough for a rough handling bearable, except for the exceptions. The assembly is very easy and does not take more than one person for installation. 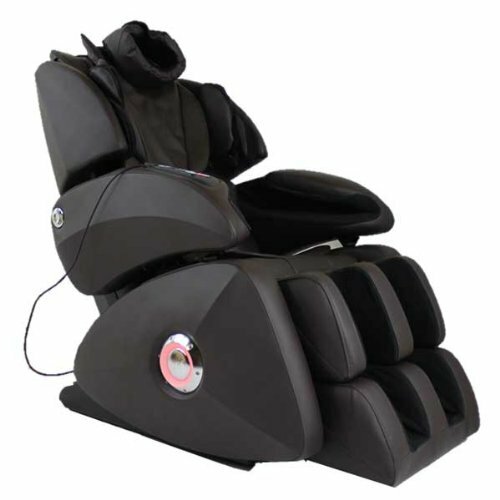 The chair has speakers in the head rest and also features a music player with vibration technology to make you groove into the songs while you enjoy your massage. The company provides free shipping which includes only curb side delivery. With the amount of weight and built they provide in the chair, it becomes difficult for one person to get the chair into the house and installed in the favourable room. The amount spent for the chair seems a little more, even though many believe that with any product of Osaki comes a little more expense at a pleasure of more comfort and a better customer service. The chair is equally heavy and powerful as the other chairs in the same price range but the main frame of the chair has a design which makes the weight of the chair concentrated to the lower part making it difficult to lift and move it around the house. For some users, the heating was a little weak especially in the lumbar and foot part. The deep tissue massage still makes you forget about the heating and you will not usually have time to notice it. The deep tissue massage is detailed to medically effective cures. If a person has suffered from any surgeries in the back or has any history of any surgery, the deep tissue massage may lead to discomfort. The features of the massage chair according to its price are just great. Still, the remote control is not advanced enough and is pretty confusing at times to operate. For a chair worth over $4,000 one does not expect and old fashioned remote control. For a person looking for the deep tissue massage chairs, this will be the cheapest of the best massage chairs providing deep tissue massage in the whole market for all price ranges. However, the chair is a little uncomfortably heavy to be carried around, the assembly once done is enough to make you leave it there and enjoy the best massage you can get for the price you paid.